This post was originally written by Hognose, from Weaponsman.com . He kindly gave me permission to re-post it here as a guest post and we are always thrilled to share his work. You can read more of the websites always excellent and always entertaining and informative posts by going to this link. Indeed it is the best website not out own. Hat tip Miguel at Gun Free Zone, who wonders if one of the mishaps Larry’s writing about is this one. You can click the link if you like (and it’s a good tale of real-world first aid), but for most of you, the illustration will remind you what can go wrong with appendix carry. That cat was danger close to living to collect the usually posthumous Darwin Award, but apparently the projectile did not connect with anything vital in his junk. Good luck, though, explaining that scar to dates. (“Go ahead and kiss it. It’s just a chancre!” probably won’t fly). Briefing of the four firearms safety rules is of course a given, after that the first aid/gun shot wound treatment and medical evacuation plan should be thoroughly briefed as if an emergency incident had already happened to you. He then runs through an emergency kit and emergency plan. It’s a good idea, for reasons we’ll cover in half a moment. Someone should be able to brief all of the above in detail. That someone should be with the party from the beginning to the end. I think it’s acceptable to have the GSW kit centralized but extra credit points for wearing it. Stan learned his first aid in the Navy. All the services teach much better and more effective first aid than they did when old dinosaurs like Tom Kratman and I went in, and even better than my old unit had on our first Afghan tour. Didn’t happen to our battalion, but in and around our time, other SF units lost guys because they exsanguinated, or developed tension pneumothorax, and the non-medics on site weren’t skilled enough to treat them. (Well, that, and medevac was weak until 2004 or so — too few frames and crews, and it’s a big country). That would never happen now; even support units get pretty decent combat life saver training. Still, it’s a lot better to use your superior weapons handling skills so as not to have to demonstrate your superior first aid skills. Stan makes another point (and another reason to Read The Whole Thing™ on Miguel’s site) in that simply briefing safety rules and plans at the start of a class is a Real Good Thing. In aviation, we found that when aircrews began briefing an instrument approach procedure-by-procedure, the number of errors (and mishaps) declined. In airborne operations, we found that when airborne units started doing a formal, stylized prejump briefing that everybody (especially devil-may-care skydivers) laughs at, the number of errors (and jump injuries) declined. It’s great that an American paratroop officer can command his battalion, regiment or division from a wheelbarrow pushed by one of his privates, but he’d probably rather not go down in history for that. IWB and particularly Appendix Carry holsters introduce risk factors that are not present in an old-fashioned outside-the-waistband holster. (We also think that schools’ focus on quick-draw engagements is usually misplaced). You can have an accident with any holster, but unless you’ve got a lot of experience, choose one that adds minimal risks. As Larry notes, if you use a safetyless (“trigger safety”, “safe action”, anything that would have scared the horse out from under a 1909 cavalryman who had the grip safety added to the 1911) firearm you need to be extra careful about holstering and reholstering. Or, well, look at the picture. Now, you can choose any firearm, and every one has its own risk factors. You can operate any handgun safely (we do not believe Larry has ever had an ND in God-knows how many Glock rounds), but you have to know it and its properties and operate it either with your mind on it 100%, or with skills drilled and drilled until you’re always, instinctively safe with it. 23-year-old man accidentally shot himself during a gun safety class at a pawn shop, according to the Orange County Sheriff’s Office. It happened at Instant Replay Pawn Shop and Shooting Range on Colonial Drive between Dean and Rouse roads, said Lt. Paul Hopkins. The gun went off accidentally and the bullet grazed his leg, Hopkins said. Amazing how this guns just “went off.” No wonder newspaper guys all want to ban guns, they think of them as malevolent presences, stalking training classes and firing ranges, bent on bringing their primordial evil to bear on their hapless bearers. Of course, that’s all bosh and nonsense. They’re simply machines, slavishly obeying the laws of physics and the input human operators apply to their user interfaces. In all history, the gun that “went off accidentally” is rarer that a comet sighting. He should admit he “set it off accidentally.” He, too, is going to live. He’ll probably never make that mistake again. But you know, we’re supposed to be able to learn from his mistake, rather than only learn from our own. 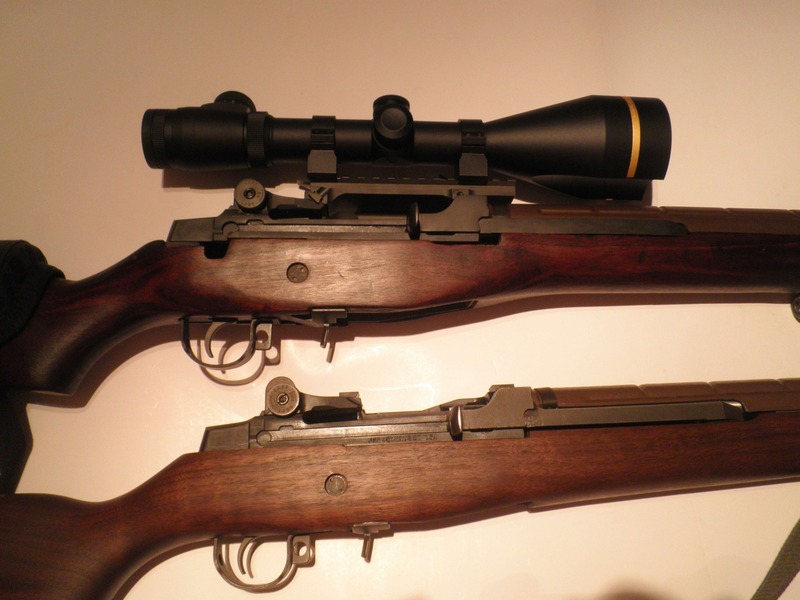 Last weeks post on the M14 and its variety of shortcomings certainly stirred up the ire of its faithful followers. Link to offending article below. Indeed we had to sleep under the bed with a gun in our hand in fear of The Old M14 Boys Club coming to take us away. Surprising to the guns fans, many spoke up with their actual real world experience with the piece confirming the point of the article. Most recent is a sand test video from In Range TV, testing the M14 against an AR15 and a MAS. While I have been told for years and against my own experience the M14 would laugh at a little sand, the video and reality seems to indicate different. The boys tested the same guns earlier in the mud. The M14 performing exactly as expected for those who know them well. My personal favorite gun blog, that is not this one, had a few words to add to the heated debate 24 hours after the festivities started with my post. Over on weaponsman.com, a lively discussion is still on going with more than a handful of real world military users speaking up. Some more discussion and viewpoint comes from a fine blog. Everydaymarksman.com. which has as a focus the owners personal quest to becoming a true rifleman and the experiences and epiphanies he has along the way. Following some of the shrill screaming, rending of clothes and gnashing of teeth has shown many missed the point, or became so angry they did not give any consideration to the post. Most often seen is the claim the point of the article was to talk up the AR10 or AR15, when that was obviously not the goal to anyone who can comprehend English. Nor was it an attempt to get anyone to hate the gun. It was a discussion of its shortcomings and the honest assessment that it is far from perfect all powerful or even a decent DMR weapon, and the caliber of the gun was not even discussed. That being the other claim, that some how we were ragging on the 308, though no mention of the effectiveness was even hinted at. While many love the rifle, nothing will change our minds from the simple truth of it. While it is better than a tamato stake. it is far from what its blind followers would like to think. Part 2 of the debunking of the absurd myth that the M4 has caused the death of US military people due to failures. Once again this is the sole work of the writer from www.weaponsman.com, THE technical website on all things military weapons related, among other topics. We again highly recommend all follow them. Part 1 is actually below this post due to the way our website is set up. Both are long posts but very detailed and worth reading if you are a real student of military fighting weapons. In the enormous1 part one of the series, we reacted to a brain-dead article published in The Atlantic by a retired Major General, who has, since his retirement 20+ years ago, been a lobbyist for defense firms and TV talking head. (Before he got his stars he was an artillery officer). We may have more to say about our brain-dead GO in a subsequent post, but we think we raised some good points about his article. We weren’t the only ones. He also ticked off Nathaniel Fitch at The Firearm Blog, and we heard, also the guys at Loose Rounds (you know, the ones that fire M4s at 1000 yards and make the steel ring? Those guys? ), and no doubt there are other places in the gunosphere flaying him. The point of today’s increment is not to make the rubble of the General’s small-arms expertise do a dead-cat-under-155-battery-closed-sheaf-fire-for-effect bounce, but to discuss the technical limits of a shoulder weapon in sustained automatic fire. Because today is a travel day, this article was mostly-dictated for speed. Therefore, we fear we have some typos we haven’t found. Let us know in the comments. Many of the problems the M16A1 had in Vietnam, and even in adoption and acceptance prior to Vietnam, were caused by the heat of sustained autofire. It was particularly problematical after powder changes made a dramatic impact on the cyclic rate of the rifle. Indeed, Colt got a contract mod allowing weapons that had a much higher sustained rate than originally specified to be accepted. Thermal waste is a huge problem for gun designers, and it’s been jamming automatic weapons since Maxim’s day. The heat is generated by the combustion of chemical powder in the chamber in barrel, but also by the metal-on-metal contact between bullet and barrel, which swages the impression of the rifling into the bullet and imparts a spin of hundreds-of-thousands of revolutions per minute to the bullet. The friction between bore and bullet is a significant contributor to barrel heating. If you were in the service, you were made to memorize something about your rifle being a “shoulder-fired, magazine-fed, air-cooled, selective-fire…” weapon. The “air-cooled” seems like a historical artifact now; the last liquid-cooled small arms were the 1917 Browning machine guns, which were last used in World War II. All modern small arms of all nations are air-cooled. That means that the air around the barrel must carry the heat of the barrel away. Meanwhile, for each round, the barrel gets hotter, because firing’s ability to load up the temperature is greater than the cooling system’s ability to remove heat. (The original M16A1 had a patented passive design for convection-driven airflow, removing the heat from the holes at the top of the handguard and drawing new air in at the bottom. Designs since then have made efforts to maintain that cooling, with little success). Because this post is long, and involved, we’re going to split it. Ahead, we describe the bad things that happen when barrels get hot; the results of M4 cyclic rate tests (including instrumented and well-documented tests to destruction), and Click “more” for the next three thousand or so words, a few pictures, and pointers to where you can find some of the math. The peak temperature area in the barrel is usually about three to seven inches forward of the chamber, depending on caliber (according to the references, on 5.56 mm rifles, it’s about four inches). This is where the thermal stress is at peak, and it also has to support all the rest of the barrel (and anything that may be attached to it, from a Surefire to an M9 bayonet), so when the gun is going to fail, it’s probably going to fail near here. The cook-off temp is a constant for a given powder, and can be experimentally determined by heating the powder on a steel plate. In the test, they did not maintain continuous fire but bursts of fire according to a firing table, then followed by letting a round sit in the chamber. Their cook-off times in live testing ranged from about 10 to about 30 minutes testing. Note that brass provides better protection from cook-off than aluminum cases, which in turn provide better protection than steel. In another experiment, Hameed et. al. built a “Chamber simulator” and developed working chamber temperature-time curves for producing cook-offs in a 7.62mm brass case with Bullseye powder. They found that below 170ºC chamber temperature, cook-offs were unlikely, and that by about 240º, the cook-off time was down to seconds. [A]n improvement to temperature sensitivity came along in 2005. [Black Hills President Jeff] Hoffman said the last change came after Black Hills technicians noticed some failures to extract (FTX) in their test M4 and short-barreled rifles, and that it was the most difficult problem to solve. It finally came down to chamber temperature. The test specification called for the ammo to be baked at 125 degrees for two hours and not exceed pressure limits when then chambered and fired. When Black Hills engineers started firing test guns far beyond the specified rate of fire, the chamber temperatures got much hotter than 125 degrees. In an extended firefight, soldiers could heat up their rifles with a few mags, and then during a lull in fighting, a chambered round would sit in a 200- or even 300-degree environment. That significantly increased chamber pressures and induced failures to extract. It only took Black Hills 75,000 rounds to sort out the problem—a chunk of the 250,000 rounds Hoffman figures the company fired developing and lot-testing the load. Finally, the round was issued. Interestingly, the ammo always did meet specs, even the ammo that Black Hills engineers felt needed improvement—they just found a way to make it better. The Navy began changing test specifications based on what Black Hills learned—and shared—during development and testing. The improved round was a hit, no pun intended, with operators in-theatre, and usage went through the roof. Not only did the ammo perform well for its intended purpose—long-range shooting—but did equally well in short-barreled rifles like the M4 (14.5-inch barrel) and MK 18 (10.3-inch barrel), which leads to a discussion of lethality. It can cause the barrel itself to fail next time it is used. At a very high temperature, the barrel is heated until it loses its temper, which can cause an invisible (and undetectable by gaging) failure of accuracy. This was first noted with aerial machine guns in WWII, as we noted here before. If continued, it can cause the barrel to fail catastrophically whilst firing. Stripped of its heat treatment and heated to the metal’s plastic temperature, the barrel droops. At first, rounds extending through it will sort of “hold it up” but soon it will be unable to contain the pressure and will burst. If the barrel doesn’t fail first, heat can cause the gas tube to fail. Weakened by high temps, the tube lets go. Any gun can cook off. The USN famously cooked off a 5″ on the destroyer USS Turner Joy in 1965 during a Vietnam War shore bombardment, killing three sailors and wounding three more. Colt has, in fact, tested M4s at cyclic rate to destruction and has made these tests public. C.J. Chivers, a former Marine, has reported on these tests in a long and readable report for, of all things, the New York Times. That report was Part II of a previous report on M4 manufacturing there. We were unable to extract the Colt videos from the Times page, but it’s very much worth reading, anyway. After the Colt tests, the Center for Naval Analyses did a report. We don’t have the report, but Kirk Ross at the US Naval Institute’s Proceedings Magazine did an excellent and thoroughly-documented synthesis of the then-known information, including the CNA report and the Colt tests, a DOD survey of weapons users, and SOPMOD program office documents. Ross’s article is an excellent short piece on these issues and we strongly recommend it. A lot of what we know about the M4 under duress comes from mid-1990s research. In the 1990s, as the then-new M4A1 carbine began reaching special operations units that shot them a lot, they began blowing them up. In June, 1995, 10th SF Group had two cook-offs. In September, the 1st Battalion of the 1st SFG reported multiple problems, including cook-offs. In May, 1996, 7th Group blew one up in its then-home-station of Fort Bragg. In August, 1996, 3rd Group blew one up on an African JCET; one USSF was injured by gun shrapnel. 5th Group and the 1st Ranger Bat also blew up guns around this time, and that began to worry SOF soldiers and leaders — and the armament procurement guys. The Army resolved to test M4s to destruction to determine what was going on. The one thing they knew was that the destroyed guns had been fired a lot, primarily full-auto fire at cyclic rates, often “burning up” excess ammunition at the end of an exercise (wasteful, but the Army makes it very difficult to turn back in unused ammo, and the Air Force is snippy about transporting it). The M16A2 was fired continuously using 30 rounds bursts. Shown in Table I are the rounds to failure, time to failure and maximum barrel temperature of the barrel. Muzzle flash increased and there was a distinct change in the sound of the weapons firing approximately 30 rounds before the barrel ruptured. There was also noticeable drooping (about 1 inch at the muzzle) of the barrel just prior to the barrel rupture. The barrel ruptured at 491 rounds with an approximately ½ inch hole in the top of the barrel about 8 inches in front of the chamber. The barrel was bent approximately 5 degrees and bulged in several locations along its length (see figures 4, 5, and 6). A plot of barrel temperature versus time at each thermocouple location is shown in figure 7. The M4A1 Carbine was fired for 540 rounds. It was thought the M4A1 barrel would rupture well before this point, therefore only 540 rounds were loaded for firing. This weapon’s barrel was noticeably bent and bulged at the end of the test (see figure 8). A plot of barrel temperature versus time at each thermocouple location is shown in figure 9. Oops. Back to the testing bench, with another M4A1 selected as a sacrifice to the gods of knowledge. A second M4A1 Carbine was fixtured for testing and fired until barrel rupture. Muzzle flash increased and there was a distinct change in the sound of the weapons firing approximately 30 rounds before the barrel ruptured. There was also noticeable drooping (about 3/4 inch at the muzzle) of the barrel just prior to the barrel rupture. The barrel was ruptured at the 12 o’clock position approximately 4 inches in front of the chamber. The rupture was approximately 1V4 inches long and 5/8 inches wide. The barrel around the rupture was bulged out about 30 percent larger than its normal diameter. The barrel was bent at the hole approximately 3 degrees (see figures 10 and 11). A plot of barrel temperature versus time at each thermocouple location is shown in figure 12. There was an approximately 30-second delay in firing of this sequence which can be seen in the temperature plots. This delay allowed additional cooling of the weapon and may have increased the number of rounds to rupture by 30 to 60 rounds. Here is the Table 1 from the report. The other figures and tables referenced in the quotes are in the report, which is linked in the Sources below, although the photo reproduction is of very low quality. Sustained firing of the M16 series rifles or M4 series carbines will rapidly raise the temperature of the barrel to a critical point. Firing 140 rounds, rapidly and continuously, will raise the temperature of the barrel to the cook-off point. At this temperature, any live round remaining in the chamber for any reason may cook-off (detonate) in as short a period as 10 seconds. Sustained rate of fire for the M16 series rifles and M4 series carbines is 12-15 rounds per minute. This is the actual rate of fire that a weapon can continue to be fired for an indefinite length of time without serious overheating. The sustained rate of fire should never be exceeded except under circumstances of extreme urgency. (Note: a hot weapon takes approximately 30 minutes to cool to ambient temperature conditions). Cook-offs out of battery result from a round which cooks off when the bolt is not locked or a round which cooks off as the user is trying to clear the weapon. Burst barrels result when the weapons are fired under very extreme firing schedules and the barrel temperature exceeds 1360 degrees Fahrenheit. When the barrel reaches these extreme temperatures, the barrel steel weakens to the point that the high pressure gases burst through the side of the barrel approximately 4 inches in front of the chamber. This condition can result in serious injury. That is, of course, exactly the failure mode in the first M4 video at Chivers’s report. And this is from a message from 1996, so SOCOM’s weapons experts knew it almost 20 years ago, and more than 10 years before Wanat. 600-700 degrees F is where cook-offs begin, and that’s reached in as few as 140 rounds on rapid semi-auto fire. The Training Answer: First, every GI should see those Colt test videos and know what his gun can, and can’t, do. While the Black Hills guys were correct in noting that SF/SOF guys usually manually fire single shots or short bursts, even most of them don’t know what happens when a gun goes cyclic for minutes at a time. A good video explaining “why you can’t do that” would be a strong addition to training, not only for combat forces, but for support elements who may find themselves in combat and feel the urge to dump mags at cyclic rate. The Morale Answer: Every GI should see the same done to AKs as well. There is a myth perpetuated by pig-ignorant people (like General Scales) that the AK series possesses magical properties and that the American weapons are crap. In fact, nobody I know of at the sharp end is at all eager to change, perhaps because the laws of physics and the properties of materials apply just as firmly to a gun originally created by a Communist in Izhevsk as they do to a concept crafted by capitalists in California. If you’ve ever fired an AK to destruction, you know that it grows too hot to hold, then the wooden furniture goes on fire, then, if you persist on firing it full-auto, it also goes kablooey. Not because there’s anything wrong with this rifle, but the laws and equations work the same for engineers worldwide. The Systems Answer: As you can see from the Colt videos, if you clicked on over to Chivers’s article, thickening the barrel nearly doubled the rounds to catastrophic failure on cyclic. An open/closed bolt cycle might have practical benefits. They wouldn’t show up in sustained heavy firing like the destruction tests, but they might show up in how a weapon recoups from high temps, and open-bolt autofire would eliminate cook-offs, at least. But any such approach needs thorough testing. The Wrong Answer: Replacing the M4 with something like the SCAR or the HK416, something that is, at best, barely better, that is much more maintenance intensive, and that, contra Scales’s assertion that his undisclosed client’s weapon is “the same price,” is twice (SCAR) or three times (416) the money. (The 416 mags are the best part of the system, though). It would be interesting to duplicate Jeff Windham’s M4A1 destruction tests with AKs and with other competitors, like the 416. Scales says a piston system like those (never mind that each one is a very different design) would not fail under the conditions seen at Wanat. We’ve seen from the information here, that the failure of firearms under high rates of fire is driven by the physical problems of waste heat and metallurgy. Our prediction is the laws of physics apply in Russia and Germany as well. Did Weapons Cause Deaths at Wanat? But it’s worth noting what the other investigations decided. The RAND report does not fault the weapons. It does suggest some theoretical future weapons developments, such as miniguns or thermobaric weapons, and points out the dead-space problem without making a specific suggestion of how to address it. The Army 15-6 investigation, came up “no,” and said so explicitly. The DOD Inspector General investigation, that was extremely critical of the leadership of the company, battalion and brigade, did not mention weapons as a factor. And so we’re not really in bad company, even though were on the other side of a Major General on this. 1. A good web article is about 300 words. A good newspaper column is about 700 words. Because we have faith in our readers’ ability to follow pieces of greater length and complexity, we frequently go to 1000 or even 2000 words (although our mean comes in around 600). That article was 3,129 words. And well illustrated, too. Windham, Jeff. Fire To Destruction Test of 5.56mm M4A1 Carbine and M16A2 Rifle Barrels. Rock Island, IL: Engineering Support Directorate, Armament Research, Development And Engineering Center. September, 1996. Retrieved from: http://www.dtic.mil/cgi-bin/GetTRDoc?Location=U2&doc=GetTRDoc.pdf&AD=ADA317929 (Abstract: http://oai.dtic.mil/oai/oai?verb=getRecord&metadataPrefix=html&identifier=ADA317929). This article comes from weaponsman.com and is re-posted with permission. As it goes into great detail on the same points we here often promote, I felt is was very important to share this in as many places as possible. Weaponsman.com is an excellent technical gun website and is a favorite of looserounds and we encourage everyone to fallow it. The Big Lie principle, as elaborated by Hitler and Goebbels, is that if you tell a small lie, you’ll be caught on it, but if you tell a really big, even outrageous whopper, people will tend to believe it. It’s an insight into human psychology which helps explain how those two second-stringers wound up seizing the levers of the most advanced nation in 20th Century Europe and running it into the ground, to the detriment of scores of millions worldwide. But right now, it’s making the rounds in our little world, as hired shills for foreign manufacturers lie about one battle to pad their own paychecks. This lie is so bold and blatant that many have come to accept it as true, even though official documents tell another story. The lie is that, “9 American Infantrymen died on 13 July 08 at COP Kahler at Wanat, Afghanistan, in the Waygul Valley of Nuristan province, because their M4 Carbines jammed”. This lie clearly doesn’t hold up if you read the historical papers, professional analyses, and interviews with survivors. What does hold up is a story of incredible devotion, dedication and heroism on the part of the Americans there, and of intelligent, bold and fearless attacks on the part of their enemies. But there are some facts the foreign-firm lobbyists don’t tell you. to start with, that they’re paid lobbyists. Then, that most of the killed were not using M4s at the time they were killed. Then, that those that were did not have jammed rifles. Then, that the survivors who did have jammed rifles, used the rifles far beyond their duty cycle, because (1) they hadn’t been trained on the limits of the weapon and its duty cycle, but mostly, (2) they hadn’t any other option: their crew-served weapons went down due to failure, ammunition exhaustion, or destruction by accurate enemy MG and RPG fire, leaving them with ugly choices: go cyclic for long periods with rifles, or get defeated. Getting defeated was not a survivable option. The M4, the standard carbine in use by the infantry today, is a lighter version of the M16 rifle that killed so many of the soldiers who carried it in Vietnam. (The M16 is still also in wide use today.) In the early morning of July 13, 2008, nine infantrymen died fighting off a Taliban attack at a combat outpost near the village of Wanat in Afghanistan’s Nuristan province. Some of the soldiers present later reported that in the midst of battle their rifles overheated and jammed. The Wanat story is reminiscent of experiences in Vietnam: in fact, other than a few cosmetic changes, the rifles from both wars are virtually the same. And the M4’s shorter barrel makes it less effective at long ranges than the older M16—an especially serious disadvantage in modern combat, which is increasingly taking place over long ranges. The M4 is a lighter version of the M16 Rifle, yes, and the 2015 Corvette is a modified version of a car introduced in 1953. There are very few parts in an M4 that are the same as the ones this guy’s artillery battery struggled with at FSB Bertchesgaden almost 50 years ago. Most of those parts are in the trigger group, and there’s always the charging handle. Apart from those, from muzzle to buttstock, from sights to magazine, it’s a new gun. [N]ine infantrymen died fighting off a Taliban attack at a combat outpost near the village of Wanat. So far, so good. (At least he notes that they did fight off the attack; a lot of careless reporters say they were overrun). Some of the soldiers present later reported that in the midst of battle their rifles overheated and jammed. Yes. You see what the author is doing there? He’s making the inferences, without saying in so many words, that their guns killed them. This is one of those things that is “true, but….” Those grunts were not killed by their guns. They were killed by the enemy, and as we’ll see, the malfunction of weapons systems was real, but not decisive. You could argue that bad training, worse officer leadership in the planning phases (the officers provided magnificent leadership under fire), and incredibly-bad site selection were responsible, instead. (The location selected for COP Kahler was the bottom of a bowl, with mountains about 7,000 feet higher surrounding the outpost 360º. It’s hard to imagine a less defensible position, yet these guys defended it). But in the end, they were infantrymen in a hard fight with a determined enemy, and guys get hurt doing that. So let’s explore the action at Wanat for a minute. Click “More” to continue. This is a long one. Thanks for hanging with us. Let’s explore the area a bit. The commanders had a logical set of reasons for putting the position here — they were too starved of airlift to support a peak position with helicopters, unlike the better-resourced soldiers of Vietnam. They needed to be on a road, both to interact with the locals (in accordance with COIN doctrine), and to bring up their supplies. Welcome to what American forces called a Vehicle Control Post, Vehicle Patrol Base, or Combat Outpost (COP). They all name it Kahler, after a respected platoon sergeant who was murdered in a green-on-blue attack. It was manned by a platoon of paratroopers, reinforced with a weapons squad with two M240 general purpose MGs, a 120-mm mortar and a TOW truck with the Improved Target Acquisition System (ITAS), and supplied with a Long Range Advanced Scout Surveillance Systems (LRAS3) system that the platoon’s artillery FO trained the riflemen to operate. It was well-equipped with crew-served weapons, but possibly on the least defensible ground imaginable — it makes Dien Bien Phu look positively defensible. SSG Phillips poured out fire, as recalled by another Engineer SPC loading for him, “…[SSG Phillips] went through three rifles using them until they jammed.”103. SSG Phillips recalled: “My M4 quit firing and would no longer charge when I tried to correct the malfunction. I grabbed the Engineers SAW [M249 5.56mm Squad Automatic Weapon] and tried to fire. It would not fire, so I lifted the feed tray tried clearing it out and tried to fire again. It would not.” SSG Phillips did not realize that SGT Queck had earlier attempted to fire this SAW, and it had failed at its first shot when a bullet jammed in the barrel. Queck had quickly discarded the SAW, swearing profanely in frustration that it was “fucked up!” (pp. 112-113). Phillips was in the main COP. The next-named soldier, SPC Bogar, was in the hardest-hit defensive position, the Observation Post established on high ground (but not on the full crest) to the east of the main position. Additionally, their SAF was so devastating that one of the grenade launchers was struck with a bullet through the feed tray, permanently disabling it. The other Mk-19 grenade launcher jammed, which they are prone to do. Thus, the American defenders at the main COP had only a single .50 caliber machine gun, the Marine M240 machine gun, and their own small arms to repel the assault. It is to the credit of the Chosen soldiers that they maintained at least fire parity from the COP. (p. 117). But when we explore the AARs and historical reports, asking, “Who exactly was killed by his weapon at Wanat?” we have a hard time putting a name to this blood libel. There were, in fact, nine men killed at Wanat. Only one was killed at the main VCP, COP Kahler — the other eight died at Observation Post Topside. Let’s add them up. The seventh man killed was SP4 Jason Bogar, the guy who had fired so many rounds from a SAW that it welded the bolt in place. As the fight went on, he got back into action, presumably with an M4, and then ran out to close with the enemy. He was killed at some distance from the OP. None of the documents or interviews suggest his M4 failed him. (7 KIA). At this point, there were four living soldiers in OP Topside, all wounded, and only one, McKaig, able to fight. The men had schlepped up what they thought of as an “assload” of ammunition, but McKaig was down to his last two magazines. At this time the survivors thought that FO SGT Ryan Pitts, who had been wounded multiple times, had died of his wounds. He was unresponsive, so the three survivors: McKaig, seriously wounded SGT Matthew Gobble, and SP4 Tyler Stafford, withdrew down the hill to the main COP. Gobble was shot and wounded again on the way down. But Pitts was not dead, just unconscious. In time he came around, and realized he was all alone, and could hear enemy talking nearby. Not good. He called for help on the radio, and a reaction squad was hastily organized at the COP and patrolled out to the OP. Shortly after arriving and reorganizing, a volley of RPGs announced a new enemy attack, and one of the RPGs scored a direct hit on SGT Israel Garcia, mortally wounding him. His M4 was not a factor in his death. (8 KIA). That’s eight of the nine killed at the battle, all of those killed at the outpost (which produced most of the killed and wounded also), and, while nobody was thrilled with weapons jams (which happened with M4, M249, M240, and Mk 19 systems), nobody died from them, either. (Ironically the one weapon that is not recorded as having jammed is the least important, the M9 pistol). Even Claymores didn’t function 100% (although they did take a toll of insurgents, some had their wires cut by the RPG barrage). What about the ninth man? The ninth man killed was the only one killed at the main outpost. He was mortar gunner PFC Sergio Abad. Abad, a young paratrooper whose leaders remembered him as “cocky,” was mortally wounded in the initial assault by fire, which was target on the crew-served weapons and their positions. That didn’t prevent him from taking his place handing 120mm mortar rounds to the men that replaced him, even as his wounds sapped his strength. His crewmates succeeded in getting him to cover, but some of them were hit again crossing open ground. The only medic was down with wounds; although another infantryman tried to decompress Abad’s chest, he died of his wounds. His M4 was not a factor in his death. In addition to the 9 Americans KIA, 27 Americans were wounded, of whom 16 were evacuated by air and 11 were treated and remained at COP Kahler. 4 Afghan National Army soldiers, who held a sector in the main COP with their Marine advisors were wounded badly enough to be evacuated, one of them extremely seriously. Intelligence sources supported a claim of 20-50 enemy killed and a greater number wounded, but only two enemy bodies, and only one AK, were recovered by US forces. A detailed analysis of these assertions shows that weapons did not fail and that problems with logistical support, while possibly hindering the creation of an impregnable defense, did not hinder the creation of an adequate defense. You can carry it all day, or you can shoot it all day, but not both. Anyone who says you can by changing to the SCAR, or the HK416, or the phased particle array in the 40 kilowatt range, is either misled himself, or trying to mislead you. Combined Joint Task Force-101, “Army Regulation 15-6 Investigation into Battle of Wanat (Redacted, Unclassified Version)” (Bagram Airbase, Afghanistan: 21 October 2008. Staff of the US Army Combat Studies Institute. Wanat: Combat Action in Afghanistan, 2008. Leavenworth, KS: US Army Combat Studies Institute, 2010. Retrieved from: http://usacac.army.mil/cac2/cgsc/carl/download/csipubs/Wanat.pdf found at: http://usacac.army.mil/organizations/lde/csi/pubs.